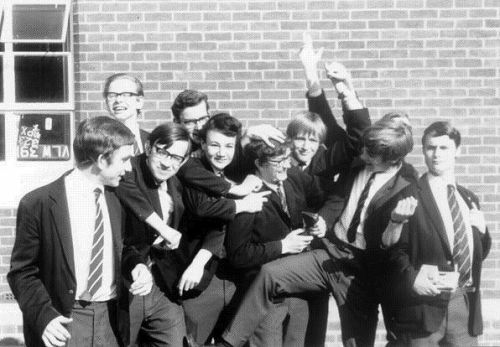 The schoolboys in this picture, taken in 1969, probably in late June, are aged 16 and 17. The oldest turned 17 in the previous November, the youngest is to turn 17 in the coming August, though deciding which is which is impossible. They're regular boys, nothing special about any of them, probably. In life some were successful, others less so. One was head of a very important local government department. One was even knighted for services to his nation. But that is whatever real life is. Your mission, should you choose to accept it, is to construct whatever you see as their lives, grabbed in this snapshot. In the unlikely event that you know their real names, please do not use them. Which are your favourite two stories? First, special for this challenge: Please look carefully at the picture. The lads in it are in need of counting. The number is not immediately obvious. Your story needs to incorporate each and every boy in the picture in some role or other, not just mentioned in passing. Better count them accurately, perhaps with a magnifying glass! I know with absoute confidence that one of those boys in the picture is most assuredly gay. The picture is from the 1960s in a British "Public School", which is a private school, and the boys are in their school uniform. There is nothing that says your story needs to reflect that with accuracy, or even at all.